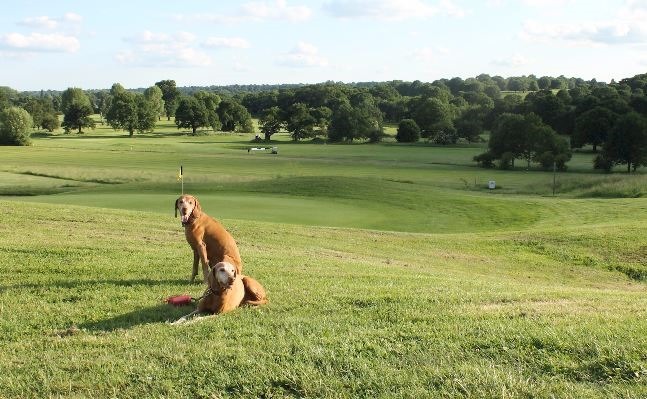 Some friends in London invited us to join them for a meal on a lovely summer’s evening and so we thought we would combine the trek into town with a stop at one of the city’s own dog-friendly courses, Richmond Park. 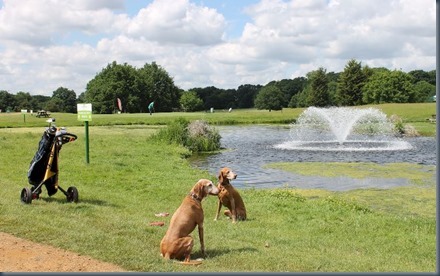 Wildlife: The first concern was the wildlife given Richmond Park’s YouTube infamy for an uncontrolled dog – Fenton – chasing a herd of deer that live there. We tend to favour off-lead courses as our dogs are very biddable and prefer and bit of wandering freedom, but given the Fenton fame, we thought that the on-lead protocol was probably a good thing. That said, we didn’t see any deer on our round. We did see plenty of geese. From the ornamental pond by the clubhouse to the little water hazard on the 10th hole. You also pass through an extended (100+ metres) wooded section to get to the 2nd hole of the Princes Course which has plenty of distracting squirrels, but most of the course is wide open and not much other wildlife to contend with. Welcome: We asked about the popularity of golfing with dogs there and the attendant said that “quite a few” golfers did bring their pooches, but we didn’t encounter any on our round. We did encounter lots of fellow golfers who we very enchanted by Rusty and Grace. Being a sunny Saturday, the course was quite packed with lots of bunching up and a bit of waiting at the tees. Eventually, we paired up with another two-some, a couple of very fine young gentlemen, to move more smoothly. They hit the rough a few times and we set Grace off to find his ball. They were quite impressed when Grace successfully found it buried in some deep grass. Walk: The course is one of the flattest that we have played and a little on the short side just over 5k. There are enough trees on the course to enhance the vista aesthetically, but not really that many. 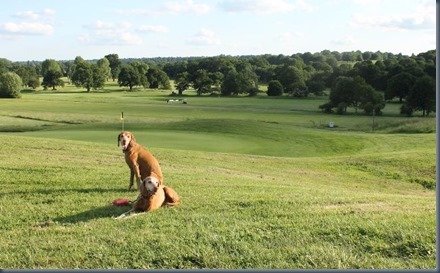 As much as we appreciated the open fairways with fewer arboreal obstacles, it did mean that only about every other hole had a shaded place for the dogs to sit while we putted. Water: Richmond Park is a bit of a parched desert when it comes to water so bring a healthy stock of water especially on the hot days. Hole 9 finishes at about the furthest point from the club house, there are no water spigots and pretty limited water features. There is the one, small stagnant pond mentioned above and a few streamlets, but they are all quite brackish and even panting Grace wasn’t interested in a sip from them. Wind Down: We finished a bit too late to go to one of our favourite dog-friendly eatieries in town, the Petersham Nurseries in Richmond Park. And, our friends who had precipitated our urban venture were staying a bit more centrally. So we reverted to our old stand-by resource of DoggiePubs.Org.uk looking for a 5-star rated dog-friendly pub near them by Regents Park. The best option was a place called The Albany. Unfortunately, a bit of a hazard with dog-friendly city pubs is busy buzz. The most dog-friendly establishments are the most relaxed ones who seem to attract and inspire a more boisterous crowd. Also, most inner city places don’t have the real estate for a beer garden and all the al fresco tables are on the sidewalk next to the (often busy) street). It was a bit too much for us to hear ourselves talk much less let the pups settle. The proprietors were helpful to provide some alternative suggestions just around the corner on Warren Street. After checking out a few that didn’t offer food, we stumbled upon Little Nan’s Bar. The menu looked fine enough and the outdoor seating had some space between the tables and the front of the building so the puppies could be away from the street. But actually, the best part about it was that hardly any cars passed by Warren Street that time of day so we could eat al fresco quite comfortably without the rush and road of vehicles. Little Nan’s offers pretty basic fare, but itself is a particularly quirky and colourful place.